shmuSOUND is the name given to the music and sound-related work at shmu. This is where shmuSOUND started – promoting all things related to local music through shmuFM. The central part of this work is the Band of the Week project, which has been running for several years and has had its own dedicated show on a Monday night from 8-10pm, since 2011. The show has featured hundreds of local bands and solo acts, many of whom have gone on to great success. Shy & DRS have taken the hip-hop world by storm, linking up with Sandi Thom, Cara Mitchell has been played on BBC 6Music and Radio 1 as well as supporting Emeli Sandé on her recent return to play the Music Hall here in Aberdeen. Amber Wilson took a break from her solo work to become a member of Bombay Bicycle Club and toured the world with them – playing to audiences of 20,000 people at some of the biggest festivals around. Each week we feature one local band or solo artist and they appear on the show, chatting to our hosts and often playing some live session tracks too. Throughout the week we promote them on our other shows and through our Facebook and Twitter pages. If you are based in Aberdeen or Aberdeenshire and would like to be our chosen artist of the week, just email sound@shmu.org.uk for more info. This year we will also be looking to expand our radio coverage to include more spoken word, including radio plays and poetry, so listen out for that. The other part of shmuSOUND involves the creation of music and sound. 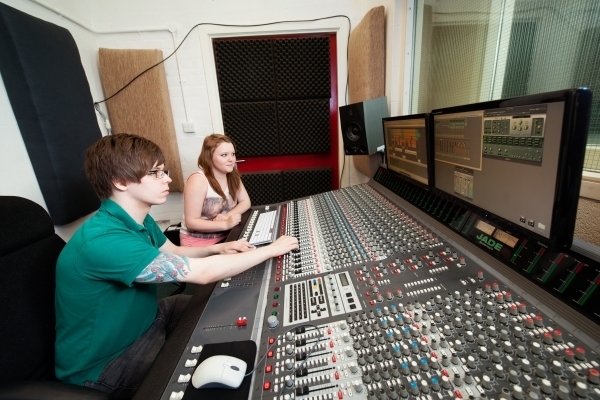 We have a state-of-the-art recording studio, based at the Tilly Youth Project in Tillydrone, which has been fully up and running since summer 2012. Our work includes projects which are funded by public bodies, such as Creative Scotland and Aberdeen City Council. For more information on our youth music work, click here. When we are not using the studio for funded work, we also hire it out to anyone who wishes to use the space. This can be a solo artist, band, choir, orchestra and we are even recording a radio play in the studio. For more info, click ‘Hire the Studio‘. For a list of the equipment we have in the studio, click here - any other queries, please just get in touch.